Yesterday, with the Hawaiian Canoe Racing Association State Championship races in Hilo ending the season, the focus now shifts to long distance races. 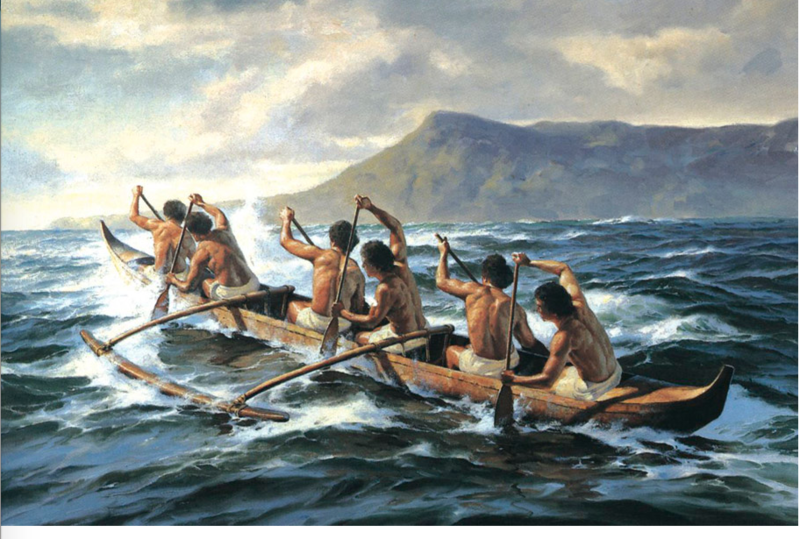 As teams train for the Na Wahine O Ke Kai and Molokai Hoe races, this may be an opportune time to share an excerpt from a chapter I wrote for Infrastructure Investor's Infrastructure Risk Management: Assessing and Managing Dynamic Exogenous Risks published by PEI Alternative Insight where I used Hawaii's rainforests and the outrigger canoe to make a significant point about the synergy required for an energy transformation for a reader audience outside of Hawaii. To avoid a prisoner’s dilemma [see my May 30 post], cooperation is inadequate to describe the necessary dynamics for an energy transformation. As keen observers of their natural and human environments and as practitioners in systems thinking, the strategies and concepts that must be embraced for a successful transformation are not foreign to Hawaiʹi’s peoples and are embedded in their heritage and values. A proverb, I ka nānā no a ʹike (meaning ‘by observing one learns’) and the Hawaiian value of Kākou (meaning ‘inclusiveness’), identify the essential components necessary to understand and accept a new paradigm through two analogies. As an island environment, and as a potential microcosm of what larger electric systems will eventually face in the future, a Hawaiʹi biomimicry analogy may be the best example to conceptualize how multiple transactions resulting from new technologies and services should interplay within Hawaiʹi’s electric systems to seamlessly optimize both individual and utility investments for mutual benefit. Hawaiʹi’s rainforests are an example of a diverse, complex system where each native forest organism is distinct but, while unique, must rely on other native forest organisms for sustenance and optimum growing conditions. Therefore, each organism must work both interdependently and cooperatively to produce a productive and efficient ecosystem that is the primary source of Hawaiʹi’s water supply. While it is difficult to put a value on the required synergy and the role of each native forest organism’s contribution to capture rainfall, the result, Hawaiʹi’s reliable water supply, is priceless. ... It takes the harmonious disciplined stroke of all six together to make the canoe surge forward through the surf with the least amount of effort, reserving the power of each when it is most needed. It takes every element of Lōkahi (agreement, cooperation and collaboration), and Kākou is achieved when the collaboration has resulted in perfect harmony and unity. These analogies describe the synergistic relationships necessary to transform Hawaiʹi’s electric systems to induce competitive markets among those providing various services who must also work cooperatively to optimize all utility, customer and third-party assets in order to maintain the function of the grid thus ensuring the delivery of a safe, affordable and reliable electricity service, which is the foundation for a robust economy as well as Hawaiʹi’s quality of life. This synergy, familiar to the Hawaiian culture as Kākou, is a call for collective action to achieve an optimal outcome. Simply put, in Hawaiʹi’s parlance, energy transformation is a Kākou thing – we are in this together. Hawaiʹi’s energy landscape is often described as a postcard from the future. As closed and bounded systems, the islands of Hawaiʹi are a manageable unit of study of complex systems that can change in a very short time period compared to a larger, continental area. Therefore, Hawaiʹi is a bellwether of what is to come for bigger electric networks and systems. Optimistically, the postcard will beckon one to a competitive-cooperative partnership within a seamless electric system paradise, a sustainable model that can be exported throughout the world. Or the postcard will heed warnings from an electric system dystopia where the commons have been ravaged solely for short-term gains. I hope for the former. Say, Rosa. 2004. Managing with Aloha: Bringing Hawaii’s Universal Values to the Art of Business. (Hawaii: Hoʹohana Publishing) at 119-120.